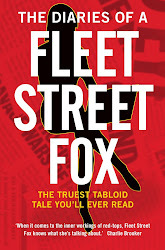 fleet street fox: Don't mention the war. EUROPE. A word guaranteed to conjure up nothing but a slightly-bored sigh for most of us, and a slightly-irritated roll of the eyes for everyone else. That's because the idea of a European anything is exciting and interesting only to Americans, Nick Clegg, and other unusuals. Today the Prime Minister has forced a number of journalists to fight the urge to stab a pen in their own eyes while listening to him talk about Europe in a speech whose contents were leaked so many times in the past few weeks you'd be forgiven for thinking his software had a glitch. Fundamentally, he said things needed to be talked about, failed to say what those things might be, and promised a national referendum on these unknown things if he won the next election which, seeing as he couldn't win the last one, makes it a fairly unlikely event. So why bother? Because his party are doing what they always do halfway through a term in office, which is start bitching with each other and complaining the Germans are trying to kick off again. The PM has said enough to shut them up for a bit, while coincidentally making his opponents look silly and threatening the Germans with a pram-exit strategy which they'll find irritating enough to maybe let him win a few points. That's it, and that's all. But in the meantime there's a bunch of people banging on about federal states, island nations, independent national determination and lots of other words which when used in conjunction with the word Europe turn simple boredom into a building urge to swallow barbiturates. If the referendum does ever happen half the nation will just expire simply because of the whole year of European argument we'll all have to endure first. And that's the main reason lots of people don't like the idea of the European Union - it's not exciting. It's depressing. It's grey. It's bureaucratic. It's Belgium incarnate. In truth the EU was born from blood and horror of such great quantities we can barely imagine it. The people who remember it are dying out, and by definition if they made it this far it's because they didn't see the worst of it. The wars were one thing. The millions who died, the tommys ordered to run towards machine guns, the sailors who drowned, the air crews shot out of the sky. The children buried under rubble. The Jews, gypsies, homosexuals, psychiatric patients, Poles and Slavs sent to the gas chambers, worked, starved, shot, brutalised. The people who collaborated to save themselves and their loved ones, the people who fled, who fought, who waited at home for the telegram. That lasted for years, but what lasted longer was the hate it left behind. 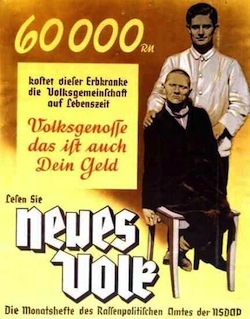 The poverty and destruction of the First World War led to the rise of Nazis who blamed Germany's problems on minorities, the disabled, the immigrant. Hitler spent years surfing the wave of growing hate and disaffection, and was in power for six years, militarising, occupying, propagandising schoolchildren, and ghettoising before other nations decided it was time to stop him. Translation: 60,000 Reich marks. What this person suffering from hereditary defects costs the People’s community during his lifetime. Comrade, that is your money too. It took another six years to get rid, and afterwards we still had the hate and poverty, the resentment, and it built again in Serbia for another European war where many were killed because of their faith, their background, or because they objected to a totalitarian solution to the world's messier problems. It's still around today. In times of economic crisis people flail for a culprit, and although we blamed banks in 2008 we can't do without them, so today we are told by the government to blame the sick, the jobless, the disabled who cost us too much. Single parents aren't unfortunate, or better-off-divorced - they're feckless, they're promiscuous. People forget all this when they talk about the European Union. It comes down, these days, to regulations about sewage outfall pipes, the Common Agricultural Policy and the never-ending dislike for bureaucrats. People forget the blood. Europe still has hate, and unfortunately it still has Nazis. But it also has a few rules, like clean drinking water and human rights, mature economies and, with 503million people and 20 per cent of the world's GDP, a degree of clout which even Americans need to take notice of. It is, undeniably, a good thing to have a supreme court capable of keeping member states in reasonable line. It is great that new customs regimes make business a bit easier, and for those that remember having to change Deutschmarks to Francs and then Pesetas, one currency makes life simpler for those as want it. Because the really good thing about the EU is not that it stops hate, which it plainly can't, nor that it gave Nick Clegg something to do while he was waiting to be ignored by David Cameron. The best thing about it is that it's a mess. It's not a nation with a single language and culture, like America. It's not a regime like Nazi Germany forcing everyone to do as it wants. It's different countries willingly co-operating on some of the big stuff, to pretty much everyone's benefit and with the main intention of avoiding more blood. It's got a dozen religions, different tax regimes, languages butting up against one another in ways that don't make any sense. It has history and resentments and only a very rough idea where it's going, which is usually the opposite of what the neighbours want. The EU is a bit like a plate piled up with a dollop of everything from the buffet. You like bratwurst, but do you really want it on your cannelloni? Paella is great too, but it's sat inside a croissant with a herring in chocolate sauce. Some people hate that kind of mess, and other people love it. There are inevitable moments when it's not to your taste, like when EU rules mean you can't deport Abu Qatada who's pretty unlikeable but has yet to actually be convicted of any crimes, but the upside of that is those same rules mean suspected rapists can be pursued across borders and sent to answer their accusers, whenever they leave the embassy. The problem with the EU always comes when people try to sort the mess out. It comes when anyone tries to turn it into a uniform group of states all behaving in the same way, like lending money to Greece and expecting them to pay it back as diligently as Austria. This week's plans for media councils in all EU states with the power to fire journalists and impose fines might be a handy way to improve press freedom in countries like Romania or France but if they tried it here its only effect would be to make the love lives and expenses of EU bureaucrats of sudden interest to the most usefully-feral Press in the world. In short, the EU is something that's best to be not quite in, and not quite out, of. It's a pond we dip our toe in, an umbrella we half-heartedly hold over most of our heads. That's not because we're British, or islanders, or lacking in commitment to the European dream - it's because that's the best way to do it. The EU has changed a lot since it was born of blood, and since we last had a vote on it in 1975. But in or out are not the best options, because it's such a complicated, messy thing that most of us would say 'sod it' and vote no just so we didn't have to endure this same old argument every few years. Far better to say we'd rather shake it all about, and try very hard not to break something which is and always has been, whatever you think of how it works in practice, a bloody good idea. 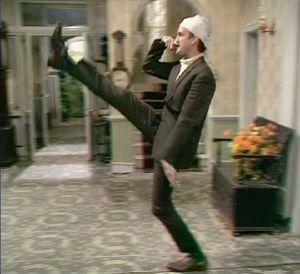 Then we can carry on annoying the Germans.